I was able to identify 451 Twitter accounts from the Netherlands. A Twitter account was considered to be held by someone from the Netherlands if the location explicitely refers to the Netherlands or if the Twitter user was located in the Netherlands according to one of the Twitter mapping mashups (see this previous post). The actual number of Dutch Twitter users is probably a lot higher. I would not be surprised if the actual number is somewhere between 800 and 1000. I was rather conservative in labeling a Twitter account as being Dutch. Only a lit bit more than half of the Twitter users specify their location in their profile (see this previous post). Furthermore private Twitter accounts or public Twitter accounts with no or only a few friends are very difficult to find. I was able to retrace the history of the Dutch Twitter accounts. The following graph is based on the date of the first message posted on each of the public Dutch Twitter accounts. There is a steep increase of the growth of the number of Twitter accounts starting from March 15, 2007. From that day on, about 10 new Dutch Twitter were detected. 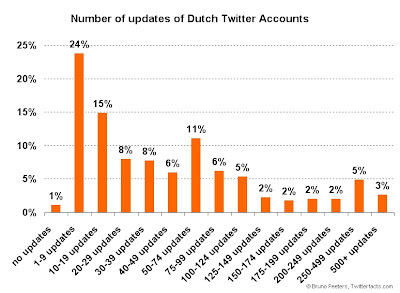 70 Twitter acounts from the Netherlands or 9,5% have chosen the keep their updates only available to their friends. According to the First State of the Belgian Twitosphere (Belgium is a neighbouring country of the Netherlands) 22% of the Belgian Twitter accounts are private. This can indicate that Dutch private Twitter accounts are perhaps partly missing from this analysis. Only 2 accounts are not available anymore. The owners of these accounts have chosen for whatever reason to stop twittering. 11% of the accounts have no Twitter friends at all. 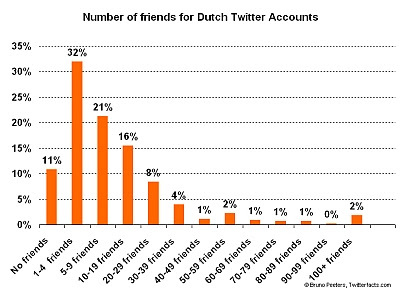 An average Twitter account from the Netherlands has 13,5 friends. A follower is someone who has indicated another Twitter account as friends and therefore receives all updates. 8% of the accounts have no Twitter followers at all, meaning that no one else on Twitter has indicated this account as a friend. An average Twitter account from the Netherlands has 12,5 followers. 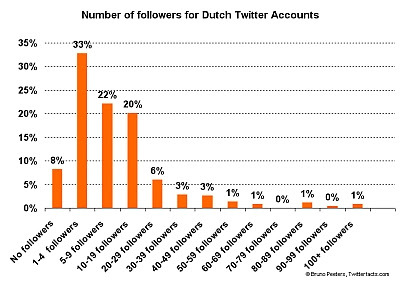 Only 1% of the accounts from the Netherlands are still waiting for their first Twitter message (or Tweet) to be published. Currently an average average Twitter account from the Netherlands has 88 Tweets. Please kind in mind that this average is only a snapshot, as lots of new Twitter messages are published everyday. The first "human" twitterer in the Top 5 is Erwin Blom on the 3rd place. 10% of all Twitter accounts from the Netherlands with a public feed did not post an update in the last 20 days. These account can perhaps be considered as "almost dead" accounts. 73% of all Twitter accounts from the Netherlands with a public feed did post at least one message in the last 7 days, indicating that these accounts are still very well alive. 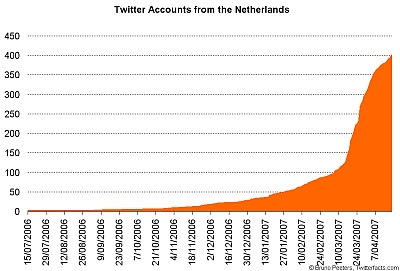 This state of the Dutch Twitosphere is only a snapshot, meaning that the figures mentioned in this post have already changed because the Twitosphere is a very dynamic environment with several new accounts being created every day, new connections being made between accounts (friends/followers) and of course new messages being written every hour of the day. The number of Twitter users in the Netherlands remains rather low compared to the number of blogs, estimated at at least 1 million. The next months will show if the popularity of Twitter will continue to increase, not only for the Dutch Twitosphere but also for the global Twitosphere. Zo zie je maar. Klein begonnen. Moet je nu eens kijken. Ben benieuwd of er nu ook van die startups zijn waar we straks allemaal mee werken. Suggesties? Its like you read my mind! You seem to know so much about this, like you wrote the book in it or something. I think that you can do with some pics to drive the message home a little bit, but instead of that, this is great blog. A fantastic read. I'll certainly be back. I enjoyed reading it. I require to study more on this topic. Thanks for sharing a nice info..Any way I'm going to subscribe for your feed and I hope you post again soon.